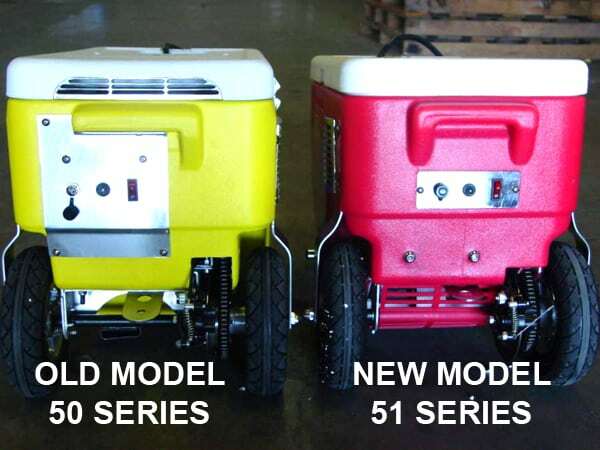 Cruzin Coolers are made to the highest possible standards, with improvements everyday to make Cruzin Cooler products the best units possible. Although we spend hundreds if not thousands of hours developing and refining our products, they are mechanical devices and failures occur. Knowing this we strive to help fix or remedy any failures as quickly and easily as possible so you can get your cooler back on the road ASAP. 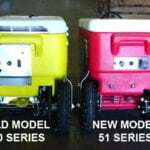 Many of the issues with the coolers can be easily fixed or repaired by the customer. Where this is not feasible you may return your cooler to our Service Center or the closest Service Center to your area, National Service Centers. If you do not see a service center in your area you can always send it to our main Service Center in Houston, Texas. Sometimes things happen and your Cruzin Cooler gets damaged. Most repairs can be made easily and quickly simply by ordering the parts you need from our website. If however you damage your cooler beyond normal repair you can ship it to our service center. We will call or email you a quote to repair your cooler. My Cooler is under warranty and there is a problem with it? Just email service@cruzincooler.com and our staff will be happy to help you get your cooler back on the road as quickly as possible. As an overview, the Cruzin Coolers have 2 basic circuits, the power circuit and the control circuit. The power circuit consists of the battery, circuit breaker and motor. The control circuit consists of the throttle, ECM (computer), on/off switch and brake switch. So basically these are the possible components that could fail: Motor, battery(s), on/off switch, brake switch, circuit breaker, throttle, controller (ECM). 1. The red light on the switch is on and the throttle on the handlebar has a green and red and it will not go at all? There are four major components of the electrical system, controller, throttle assembly on the handle bars, batteries and motor. Here is a quick way to find the problem. 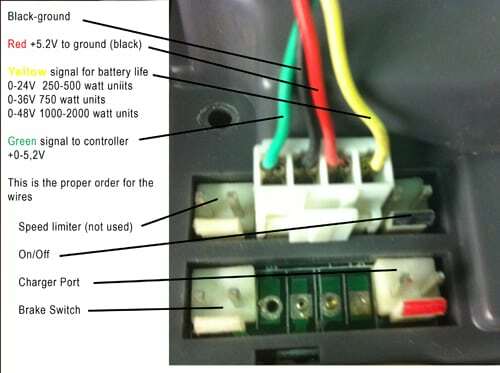 There is also a wiring diagram below and also see wiring to help you with the wiring connections. Below is a step by step checklist for the above problem. Step 1. BE SURE CHARGER IS NOT PLUGGED INTO COOLER, IT WILL NOT RUN! Step 2. Be sure that the switch in the back is on and illuminated. Step 3. Be sure that the brake lever is not depressed, this cuts off power to the motor. Step 5. Check to be sure all of the wires are connected in the motor compartment especially that all plugs are tightly connected. Step 6. Raise the drive wheel off the ground so it will not take off if power is restored. Turn unit on and with lid open turn throttle wide open and hold it wide open. Now move the wires and squeeze the connections to see if the unit suddenly starts. Push the plugs on the controller and push the individual wires into their plugs on the controller. Sometimes this may locate a loose connection. Step 7. You can unplug (the brake switch is normally open) the red and black wires which come from the brake handle to the rear motor area. It is the wire that comes in from the side vent that has 2 wires in it, not the one with 4. Turn the throttle, If the unit goes you have a bad brake switch. If not go to Step 8. Step 8. You will need a volt meter for the following tests. They are cheap and available at Radio Shack and other department stores. Measure the voltage at the controller (ECM), you should have 24V for 250-500 watts, 36V for 750’s and 48V on 1000’s at the power plug into the ECM. If you don’t go to battery circuit test. Step 9. While holding throttle wide open check the output voltage to the motor and see if you get a reading of the proper voltage. If yes, replace your motor. Step 10. To check throttle you can measure the voltage of the wires. If you short any of these wires you may burn up the ECM and throttle. The wires read as follows, red-+5.2V reading to black, black-system ground, yellow, 24-48V+ depending on system voltage (24,36,48V). This is for the light indicator on the handlebars to show system voltage. The green wire is the +0-5.2V signal from the red wire. Therefore to check if throttle is bad unplug throttle and jump red to green. If unit runs you have a bad throttle, if not you have a bad controller (ECM). Step 11. You can unplug your charger port from the ECM, if shorted will not let the unit run. It is the wire from the back control panel where the charger plugs in. Step 12. If everything is lit you may still have a loose terminal connector at the rear breaker. 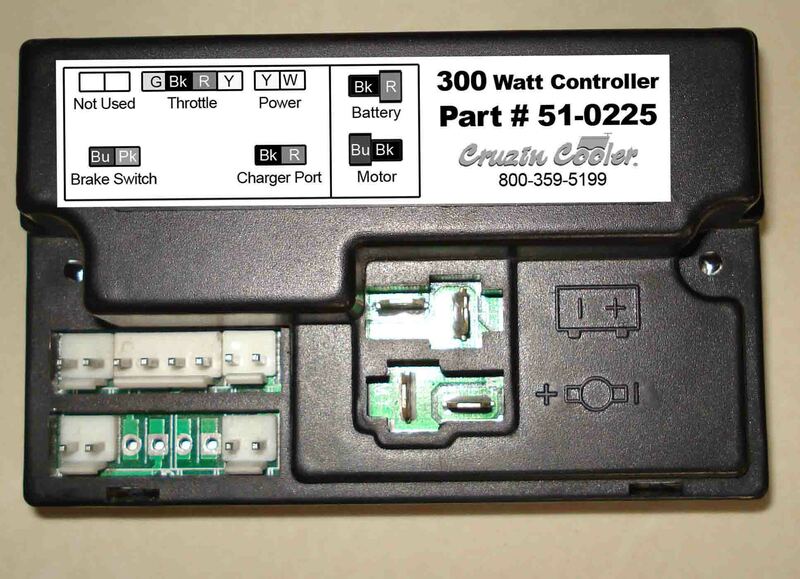 Sometimes the connector will break inside of the plastic shrink wrap so it appears it is still connected, however it has enough conductivity to turn on the lights but you will not get any throttle response. You may need to cut the shrink wrap off of the wires to see if the connector is broken. These are the two wire connectors that plug onto the breaker. If you have a volt meter you can check the voltage at the ECM for proper voltage. Step 13. If you don’t have a volt meter or want to see if motor windings are okay you can us a simple method. You jump the battery wires straight to the motor to see if the motor runs, of course a volt meter is the best way to check. and you need to be sure that the drive wheel is off the ground. If you have long enough wires you can drive it by connecting the jumper wires outside of the cooler and drive it. Remember that this is full throttle and depending on your power level of your cooler you need to be cautious if you decide to drive it this way. If the motor runs fine you need to look at the control parts. Step 14. If you made it here you probably have a bad controller (ECM) or a bad throttle on the handle bars. If you are knowledgeable with wiring a technician can help you figure out which component is bad. For the technical people go to technical for wiring help. 2. The red on/off switch light is not illuminated and the handlebar lights are not on. This is a simple problem normally caused from a disconnected wire from the batteries. Follow the steps below. Step 1. Be sure that the switch in the back is on. Step 2. Make sure that the circuit breaker located on the exterior back electrical plate is not tripped (sticking out). Step 3. 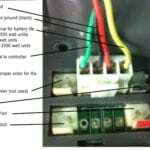 Make sure the fuse located (on older models, 50 series) on power supply in the wiring harness is not burned out. Step 4. Check to be sure all of the wires are connected in the motor compartment especially that all plugs are tightly connected. Step 5. Make sure the battery connections are tight. Step 6. If none of the lights still come you will need a voltmeter to continue testing. Step 7. Check for (24V 250-500watt,36V 750watt, 48V-1000watt) depending on your model, where the power plugs into the ECM. If you do not have the proper power trace back to find bad connection. Step 8. If you are electrically inclined you can check to see if your on off switch is bad. This will cause the problem above. You can jump out the two power pins where the on off switch plugs into the ECM and see if the throttle lights up. If so you have a bad on off switch. 3. The yellow light comes on the handlebars shortly after I charge it and it barely runs, or it is does not go very far after being charged. This is a normally a sign of bad batteries or bad connection. Batteries start dying from the first day you use them and are normally good for 300 cycles, or complete charge and discharges. Follow the steps below. Step 2. Even if your batteries have 12V or more each that does not mean they are good. They may have the proper voltage but no power or amps behind the voltage, which is typical on bad batteries. Step 3. If you think your batteries are bad take them out and have them checked at a battery store or local auto parts store. Remember for replacement batteries we supply the ones made for deep cycling and high amp ratings. For replacement batteries go to parts. 4. My cooler runs without anything on or not turning throttle. This is either a bad ECM or a bad throttle. Follow the steps below. Step 1. Unplug the throttle and turn switch on, if unit does not run, probably a bad throttle. You can check the voltages as shown above for the throttle to see if you have proper voltage to the throttle. Step 2. Unplug everything except the battery and motor. If unit runs you have a bad ECM. Step 3. If it does not run plug in the on/off switch and charger port. If it does not run you probably have a bad throttle. 5. The on/off light dims slowly or goes off when I unplug the charger. This is a normally a sign that the batteries are not making a connection and problem is in the power circuit. Follow the steps below. Step 2. Your problem is that you have a bad connection between the battery and ECM. 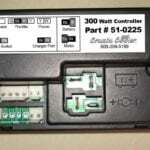 Check the circuit breaker connections first and then battery connections. Just because it appears that the wires are okay at the circuit breaker a lot of times the wire will break inside of the plastic shrink wrap. Check this closely as it has a high probability. Your problem is in this circuit. You should not have any problems with a Coolagon, if so contact service at service@cruzincooler.com. What do I do if I need parts? This is one of our biggest target areas for complete customer satisfaction and the biggest complaint from people who buy any old scooter from overseas. We will stock everything you could ever need for your cooler, all the time. To get a warranty replacement part you need to either order a part online and return bad part with RMA for refund or send in the bad part for a free replacement. Not sure which model you have? Click to enlarge the image. 51 Series Cooler Wiring Diagram. Click to enlarge. For more wiring diagrams, click here.